The Facial Pain Research Foundation, TNnME members and the International Trigeminal Neuralgia Awareness Fighters give thanks to all those that are participating in the 2018 "Light Up Teal" the 6th Annual International Trigeminal Neuralgia Awareness Day on October 7th 2018. This year campaign is dedicated to promoting to the World Health Organization by asking them to add Trigeminal Neuralgia to their "Health Topic List"! ​Adding Trigeminal Neuralgia to the “Health Topic List” of illnesses will expand awareness, grant access to further resources, and create opportunities for funding and research. ​2018 Light Up Teal Hashtags! We give thanks and gratitude to everyone at Vilnius City Administration for the Zverynas Bridge Vilnius Lithuania Lighting Up TEAL for the 6th International Trigeminal Neuralgia Awareness Day on October 7th 2018! It is a hundred year old bridge over Neris, which survived both World Wars. The Bridge was built in 1906 and name Nikolay Bridge at the time. ... During Vilnius’s expansion Zverynas was annexed to the city. ​Milwaukee County Historical Society Museum Wisconsin We give thanks and gratitude to everyone at Milwaukee County Historical Society Museum Wisconsin for Lighting Up TEAL for the 6th International Trigeminal Neuralgia Awareness Day on October 7th 2018! We give thanks and gratitude to everyone at First Parish Unitarian Church in Fitchburg Massachusetts for Lighting Up TEAL for the 6th International Trigeminal Neuralgia Awareness Day on October 7th 2018! Unitarian Universalism is a multi-theological faith tradition that encourages individuals to think for themselves. Drawing from many different religions and wisdom sources, Unitarian Universalists understand that no single religion, tradition, or person has all the answers. The Convention Centre Dublin Ireland We give thanks and gratitude to everyone at The Convention Centre Dublin Ireland for Lighting Up TEAL for the 6th International Trigeminal Neuralgia Awareness Day on October 7th 2018! The Convention Centre Dublin in the Dublin Docklands was opened in September 2010. The Convention centre overlooks the River Liffey at Spencer Dock. The CCD is a truly iconic building, inside and out. Learn more about the building’s design and construction, as well as the architectural vision behind it. We give thanks and gratitude to everyone at ​James K Polk Cultural Center Nashville Tennessee for Lighting Up TEAL the Marquee Message for the 6th International Trigeminal Neuralgia Awareness Day on October 7th, 2018! ​For the marquee message: "Support International Trigeminal Neuralgia Awareness Day"
The Tennessee Performing Arts Center (TPAC) located within the James K. Polk Cultural Center. It’s a gathering place for friends and families waiting to enjoy time and the arts together. A place to laugh or experience live theatre and music. ​Ben Franklin Bridge Philadelphia, Pennsylvania United States We give thanks and gratitude to everyone at The ​​​Ben Franklin Bridge Philadelphia, Pennsylvania for Lighting Up TEAL for the 6th International Trigeminal Neuralgia Awareness Day on October 7th, 2018! The Benjamin Franklin Bridge, originally named the Delaware River Bridge, is a suspension bridge across the Delaware River connecting Philadelphia, Pennsylvania, and Camden, New Jersey. We give thanks and gratitude to everyone at The ​​City Hall Wichita, Wichita Kansas for Lighting Up TEAL for the 6th International Trigeminal Neuralgia Awareness Day on October 7th, 2018! We give thanks and gratitude to everyone at The ​Waterford Health Park Waterford Ireland for Lighting Up TEAL for the 6th International Trigeminal Neuralgia Awareness Day on October 7th, 2018! Dr. Mark Rowe and the Waterford Health Park are part of an international research collaboration called ‘The CARITAS Project.’ The building is a leading example of ‘Generative Space’ in the Health Care Setting. The CARITAS Project seeks to transform the future of health and healthcare delivery through the development of strategies and technologies that produce sustainable environments. The Big Dam Bridge Little Rock Arkansas USA We give thanks and gratitude to everyone at The Big Dam Bridge Little Rock Arkansas for Lighting Up TEAL for the 6th International Trigeminal Neuralgia Awareness Day on October 7th, 2018! Experience the longest pedestrian and bicycle bridge in North America, built specifically for that use. This impressive structure was named the Big Dam Bridge because of its massive 4,226 foot span built atop Murray Lock and Dam. Hotel MS Milenium Monterrey Mexico We give thanks and gratitude to everyone at ​​The Hotel MS Milenium Monterrey Mexico for Lighting Up TEAL for the 6th, International Trigeminal Neuralgia Awareness Day on October 7th 2018! Located in the distinguished Zona Valle-San Pedro, in the city of Monterrey, in a privileged location, MS MILENIUM allows every traveler to enjoy the best location in Monterrey, close to corporate offices, restaurants, shopping centers, nightlife and only 30 minutes from the Monterrey International Airport. ​The Mercedes-Benz Superdome New Orleans Louisiana United States We give thanks and gratitude to everyone at ​​The Mercedes-Benz Superdome New Orleans Louisiana for Lighting Up TEAL for the 6th, International Trigeminal Neuralgia Awareness Day on October 7th 2018! They will light up teal October 9th! The Mercedes-Benz Superdome is established as a premier destination for every type of event, and the grand structure builds on that legacy continually. From the biggest, most elaborate productions that thrill thousands to memorable intimate gatherings, the Superdome adapts and captivates. Located in the heart of the New Orleans Central Business District, the Superdome is among the most enviable venues in the nation. We give thanks and gratitude to everyone at ​Edinburgh Castle Castlehill, Edinburgh Scotland UK for Lighting Up TEAL for the 6th, International Trigeminal Neuralgia Awareness Day on October 7th 2018! ​Willis Tower Chicago IL United States We give thanks and gratitude to everyone at ​Chicago Willis Tower Chicago IL for Lighting Up TEAL for the 6th, International Trigeminal Neuralgia Awareness Day on October 7th 2018! Vancouver Lookout Vancouver BC Canada We give thanks and gratitude to everyone at ​Vancouver Lookout Vancouver BC Canada for Lighting Up TEAL for the 6th, International Trigeminal Neuralgia Awareness Day on October 7th 2018! Panoramic 360° views of Vancouver. 40-second ride in a glass elevator that whisks you skyward. Observation Deck is 553.16 feet (168.80m) above Vancouver. Vinoteca Stores Monterrey Mexico We give thanks and gratitude to everyone at ​Vinoteca Stores Monterrey Mexico for Lighting Up TEAL for the 6th, International Trigeminal Neuralgia Awareness Day on October 7th 2018! Excellence in service and Pro activity: Exceeding the expectations of our internal and external clients, finding satisfaction and meaning in the work, as well as developing the capacities to produce results that generate the highest possible value for the company. We give thanks and gratitude to everyone at ​Torre Avalanz San Pedro Garza Garcia NL Mexico for Lighting Up TEAL for the 6th, International Trigeminal Neuralgia Awareness Day on October 7th 2018! We give thanks and gratitude to everyone at ​Avanta Gardens San Pedro Garza Garcia NL Mexico for Lighting Up TEAL for the 6th, International Trigeminal Neuralgia Awareness Day on October 7th 2018! ​Avanta Gardens shopping and restaurant space with a sphere that lights up. We give thanks and gratitude to everyone at The Arboledas San Pedro, Garza García, NL. Mexico for Lighting Up TEAL for the 6th, International Trigeminal Neuralgia Awareness Day on October 7th 2018! The best location, the safest development in Mexico, a place full of creativity and outdoor recreation within a majestic design created by César Pelli and more than 12 international fi rms. ​We give thanks and gratitude to everyone at The ​​El Palacio de Hierro Monterrey Mexico​ for Lighting Up TEAL for the 6th, International Trigeminal Neuralgia Awareness Day on October 7th 2018! The first and most sophisticated department store in Mexico, offering since 1891 services of excellence and products of the most prestigious national and international brands. ​We give thanks and gratitude to everyone at The ​​Shannon Airport Co. Clare, Ireland​ for Lighting Up TEAL for the 6th, International Trigeminal Neuralgia Awareness Day on October 7th 2018! Shannon Airport is unique both in its location and its place in the history of world aviation. Of all European Airports it is situated at the most western point, making it the ideal stepping stone between the old world and the new. Chosen for its geographical position as the transatlantic gateway between Europe and America, Shannon was designated as Ireland’s Transatlantic Airport at its inception by the Irish Government. We give thanks and gratitude to everyone at The ​​Centennial Wheel Navy Pier Chicago IL United States for Lighting Up TEAL for the 6th, International Trigeminal Neuralgia Awareness Day on October 7th 2018! ​We give thanks and gratitude to everyone at The ​​Mitchell Park Domes Milwaukee Wisconsin United States for Lighting Up TEAL for the 6th, International Trigeminal Neuralgia Awareness Day on October 7th 2018! The Mitchell Park Horticultural Conservatory, better known as The Domes, is one of the most unique destinations in Milwaukee. Discover cacti, succulents, shrubs and desert palms in the Desert Dome. Enjoy five seasonal shows each year in the Floral Dome and walk among 1,200 species of rain forest plants in the Tropical Dome. ​Sydney Town Hall Sydney Australia We give thanks and gratitude to everyone at The ​Sydney Town Hall Sydney Australia for Lighting Up TEAL for the 6th, International Trigeminal Neuralgia Awareness Day on October 7th 2018! Located in the heart of the city, Sydney Town Hall is an iconic civic landmark which combines state-of-the-art venue facilities with spectacular heritage architecture and interior decoration. Inside, the splendour of the Vestibule and Centennial Hall offer a unique event and venue space. ​We give thanks and gratitude to everyone at ​Pulaski Bridge Brooklyn-Queens New York for Lighting Up TEAL for the 6th, International Trigeminal Neuralgia Awareness Day on October 5th -7th 2018! The Pulaski Bridge, which carries six lanes of traffic and a pedestrian sidewalk over Newton Creek and the Long Island Expressway. ​Royal National Theatre South Bank London United Kingdom We give thanks and gratitude to everyone at ​Royal National Theatre London United Kingdom for Lighting Up TEAL for the 6th, International Trigeminal Neuralgia Awareness Day on October 7th 2018! ​US Bank Center Wisconsin Milwaukee We give thanks and gratitude to everyone at US Bank Center Wisconsin Milwaukee USA for Lighting Up TEAL for the 6th, International Trigeminal Neuralgia Awareness Day on October 7th 2018! 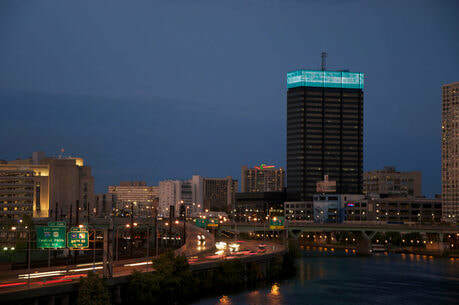 They will light up the top of the building teal on October 6 through October 8th! ​The US Bank Center, Wisconsin’s tallest building, stands at 601 feet high and contains a total enclosed area of approximately 1.3 million gross square feet. This premier office complex includes a 42-story tower with an average floor size of 22,100 square feet, an expansive two-story lower lobby and atrium that spans on the north and south side of the tower, an attached parking structure, and convenient skywalks to adjacent buildings. The Emirates Spinnaker Tower Gunwharf Quays, Portsmouth, Hampshire United Kingdom We give thanks and gratitude to everyone at The Spinnaker Tower at Gunwharf Quays, Portsmouth, United Kingdom for Lighting Up TEAL for the 6th, International Trigeminal Neuralgia Awareness Day on October 7th 2018! Spinnaker Tower Soaring 170m above Portsmouth and the Solent, the Spinnaker Tower is taller than the London Eye, Blackpool Tower and Big Ben. The three viewing decks with floor-to-ceiling glass windows provide breathtaking 350 ̊ panoramic views stretching up to 23 miles, giving visitors a unique perspective of the city and surrounding area. Daring visitors can almost walk on air by crossing the glass floor on view deck one before enjoying refreshments in the Café in the Clouds on the second viewing level. ​Vancouver B.C. Science World We give thanks and gratitude to everyone at Vancouver, BC Science World Canada for Lighting Up TEAL for the 6th, International Trigeminal Neuralgia Awareness Day on October 7th 2018! ​Science World is a not-for-profit organization that engages British Columbians in science and inspires future science and technology leadership in our province. Route 52 Causeway Bridge Ocean City New Jersey We give thanks and gratitude to everyone at the Route 52 Causeway Bridge Ocean City New Jersey USA for Lighting Up TEAL for the 6th International Trigeminal Neuralgia Awareness Day on October 7th 2018! Known first as Peck’s Beach, a seven-mile stretch of sand dunes, meadows, and cedar swamps was probably named for John Peck, a whaler who used the island as a staging spot for his whaling operation. The island had served as a summer fishing camp for local Indians, a grazing land for cattle driven out from the mainland, and an occasional hunting or picnic spot for mainland residents who would come out by boat. Tucson City Hall Tucson Arizona We give thanks and gratitude to everyone at the Tucson City Hall Tucson Arizona USA for Lighting Up TEAL for the 6th International Trigeminal Neuralgia Awareness Day on October 7th 2018! Tucson City Hall will light up teal on Saturday October 6th, 2018 5:30 pm. FP SGL Tucson is also doing a Fundraiser for the Facial Pain Research Foundation on Sunday, October 7, 2018 from noon to 4pm. The mayor of Tucson is scheduled to attend. http://strikeout18.auction-bid.org/ Thank you Diane Winn for this. We give thanks and gratitude to everyone at the RSA Trustmark Building in Mobile Alabama USA for Lighting Up TEAL for the 6th International Trigeminal Neuralgia Awareness Day on October 7th 2018! The Trustmark building is a steel framed 34 story, International Style office tower with a six-story, 480-space parking garage encompassing the first six floors. We give thanks and gratitude to everyone at The Renaissance Mobile Riverview Plaza Hotel Mobile Alabama ​USA for Lighting Up TEAL for the 6th International Trigeminal Neuralgia Awareness Day on October 7th 2018! We give thanks and gratitude to everyone at The Battle House Tower in Mobile Alabama ​USA for Lighting Up TEAL for the 6th International Trigeminal Neuralgia Awareness Day on October 7th 2018! The RSA Battle House Tower is the largest building in Alabama and generally regarded as one of the best office buildings in Mobile. We give thanks and gratitude to everyone at The Renaissance Montgomery Hotel & Spa RSA Montgomery Alabama for Lighting Up TEAL for the 6th International Trigeminal Neuralgia Awareness Day on October 7th 2018! We give thanks and gratitude to everyone at The RSA Tower Building in Mongtomery Alabama for Lighting Up TEAL for the 6th International Trigeminal Neuralgia Awareness Day on October 7th 2018! The RSA Tower Complex is considered the trophy of the Retirement Systems of Alabama's Montgomery office portfolio. This complex consists of the RSA Tower, the tallest building in the capital. Peco Crown Energy Building Philadelphia PA USA We give thanks and gratitude to everyone at The Peco Crown Energy Building in PA USA for Lighting Up TEAL for the 6th International Trigeminal Neuralgia Awareness Day on October 7th 2018! The following message will be displayed on the Crown Lights on October 5th, 6th and 7th! ​ "October 7th is Trigeminal Neuralgia Awareness Day "
We give thanks and gratitude to everyone at The Miami Towers in Miami Florida USA for Lighting Up TEAL for the 6th, International Trigeminal Neuralgia Awareness Day on October 7th, 2018! An icon on the Miami-Dade skyline, Miami Tower is also the city's premier business address. Miami Tower has been an icon on the skyline of downtown Miami for more than 25 years. The new LED architectural lighting system gives us the ability to transform the skyline in a matter of seconds. We give thanks and gratitude to everyone at ​The Nicosia Municipality Town Hall Nicosia Cyprus for Lighting Up TEAL for the 6th International Trigeminal Neuralgia Awareness Day on October 7th, 2018! ​In 1944 they were moved, temporarily, to the building that had housed the Luna Park cabaret on the Davila bastion. In 1951 it was renovated to house the municipal offices permanently. The Hadjisavva opening renamed Metaxas Square was increasingly perceived as the town centre. Riverwalk Commons Newmarket Ontario Canada We give thanks and gratitude to everyone at The Riverwalk Commons Newmarket ON Canada for Lighting Up TEAL for the 6th International Trigeminal Neuralgia Awareness Day on October 7th, 2018! ​The park has become a source of civic pride; a space for skating in the winter, cooling off in the splash pad in the summer, stopping to enjoy a rest by the river while enjoying the trails, and a place where neighbors reunite at the farmers market. We give thanks and gratitude to everyone at The Montenotte Hotel Cork City Ireland for Lighting Up TEAL for the 6th International Trigeminal Neuralgia Awareness Day on October 7th, 2018! ​Shin Kong Xinyi Financial Center Taipei Taiwan We give thanks and gratitude to everyone at the ​​​Shin Kong Xinyi Financial Center Taipei Taiwan for Lighting Up TEAL for the 6th International Trigeminal Neuralgia Awareness Day on October 7th, 2018! ​President International Tower Taipei Taiwan We give thanks and gratitude to everyone at the ​​​President International Tower Taipei Taiwan for Lighting Up TEAL for the 6th International Trigeminal Neuralgia Awareness Day on October 7th, 2018! ​President International Tower is a skyscraper located in Xinyi District, Taipei, Taiwan. It is the fifth tallest in Xinyi Special District. ​W Hotel Taipei Taiwan We give thanks and gratitude to everyone at the ​​W Hotel Taipei Taiwan for Lighting Up TEAL for the 6th International Trigeminal Neuralgia Awareness Day on October 7th, 2018! Here is the artistic icon right in the heart of the exhilarating Xinyi district, where the city's most exuberant nightlife, scintillating entertainment, hottest fashion and other spectacular attractions reside. ​PIDC Buildings - Taipei City Hall Bus Station Taipei Taiwan We give thanks and gratitude to everyone at the ​​Uni-UStyle Taipei Store Taiwan for Lighting Up TEAL for the 6th International Trigeminal Neuralgia Awareness Day on October 7th, 2018! Uni-President Hankyu Taipei, a fashion-oriented business investment under the Uni-President Corporation umbrella, opened in October, 2010, renamed Uni-President Taipei since March, 2016. It is a successful cooperation of Uni-President's investment resources and the corporation's retail experiences devoted to beauty and fashion. Uni-President Taipei is committed to giving customers quality shopping and leisure. ​​Farglory Financial Center Taipei Taiwan We give thanks and gratitude to everyone at the ​Farglory Financial Center Taiwan for Lighting Up TEAL for the 6th International Trigeminal Neuralgia Awareness Day on October 7th, 2018! We give thanks and gratitude to everyone at the ​CPC Corporation Taiwan for Lighting Up TEAL for the 6th International Trigeminal Neuralgia Awareness Day on October 7th, 2018! Orlando Public Arts Orlando Florida We give thanks and gratitude to everyone at Orlando Public Arts Orlando Florida for Lighting Up TEAL for the 6th International Trigeminal Neuralgia Awareness Day on October 7th, 2018! ​Public art is artwork placed in highly trafficked areas for public viewing. Large-scale sculptures, exhibition spaces, and site-integrated aesthetic works are all examples of public art. Concentrating on downtown plazas, city parks, neighborhood community centers, and municipal buildings, the Public Art Program strives to place artwork in highly visible locations and choose artwork that reflects the character of that community. The Mansion House, Dublin Ireland We give thanks and gratitude to everyone at The Mansion House Dublin Ireland for Lighting Up TEAL for the 6th International Trigeminal Neuralgia Awareness Day on October 7th, 2018! ​For the past 300 years, the Mansion House has welcomed Dubliners, international & civic leaders, cultural stars and sporting heroes through its doors. As part of our 300-year celebrations, the public rooms of the Mansion House will be open for guided tours. FMC Tower, Cira Center Tower Philadelphia PA USA We give thanks and gratitude to everyone at FMC Tower and Cira Centre Philadelphia PA USA for Lighting Up TEAL for the 6th International Trigeminal Neuralgia Awareness Day on October 7th, 2018! FMC Tower and Cira Centre South, a progressively-designed urban campus is redefining work-space utilization for the next generation. As the City’s first true “vertical neighborhood,” it is a sustainable and eco-progressive approach to the live-work-play balance embraced by emerging business leaders. Collaborative, innovative, and engaging are the guiding principles. ​Perth Concert Hall Perth Australia We give thanks and gratitude to everyone at The ​Perth Concert Hall Perth Australia for Lighting Up TEAL for the 6th International Trigeminal Neuralgia Awareness Day on October 7th, 2018! Perth Concert Hall is renowned for having one of the finest acoustics in the southern hemisphere. The concert hall is the home and serves as the primary performance venue for the West Australian Symphony Orchestra (WASO), and hosts a number of diverse performances and events all year round. The Fountain at Lafarge Lake in Coquitlam Canada We give thanks and gratitude to everyone at The fountain La Farge Lake Coquitlam B.C. for Lighting Up TEAL for the 6th International Trigeminal Neuralgia Awareness Day on October 7th, 2018! ​​Coquitlam’s Town Centre Park is a destination city-wide park that also serves the local community, providing exceptional sport, recreation and cultural amenities and experiences. The KeltiCenter is a complex that houses corporate offices, an event hall on the top floor and commercial spaces. We give thanks and gratitude to everyone at ​Lit Brothers, Philadelphia, Pennsylvania United States for Lighting Up TEAL for the 6th International Trigeminal Neuralgia Awareness Day on October 7th 2018! The Lits Building is located at 8th & Market Streets,literally on top of one of the city’s major transit infrastructures and right near major Philly attractions like Independence Mall and the newly-renovated Pennsylvania Convention Center. There is a major revitalization of the area underway— by multiple partnerships—one that focuses on restoring both the landmarks as well as the activities that have marked Market Street’s diverse history. Mississauga Civic Centre Clock Tower Canada We give thanks and gratitude to everyone at Mississauga Civic Centre Canada for Lighting Up TEAL for the 6th International Trigeminal Neuralgia Awareness Day on October 7th 2018! The 9,000-square metre Civic Square, on the exterior south side of the Mississauga Civic Centre, consists of gardens and public activity areas. The Civic Centre is located at 300 City Centre Drive, just south of the Living Arts Centre and north of the Mississauga Central Library. ​​Electric Tower Buffalo New York We give thanks and gratitude to everyone at Iskalo Development Corp, The ​Electric Tower Buffalo New York for Lighting Up TEAL for the 6th International Trigeminal Neuralgia Awareness Day on October 7th 2018! ​When Iskalo Development acquired the Electric Tower, the company knowingly took on the responsibility of restoring a highly recognizable building with a history that has mirrored that of the City of Buffalo. Built during Buffalo’s run as one of America’s largest and most progressive cities, the building, through a series of changes over the years, lost some of its original luster and had become functionally obsolete by today’s standards. After 18 months of planning and design and 15 months of construction, this historic property was now prepared to participate in downtown Buffalo’s renaissance. Indianapolis Power & Light Building We give thanks and gratitude to everyone at The Indianapolis Power & Light Building (IPL) Indianapolis Indiana for Lighting Up TEAL for the 6th International Trigeminal Neuralgia Awareness Day on October 7th 2018! We give thanks and gratitude to everyone at the Kimpton Cardinal Hotel Winston-Salem NC for Lighting Up TEAL for the 6th, International Trigeminal Neuralgia Awareness Day on October 7th, 2018! UPDATE: Lighting up TEAL will take place on October 6th, 2018! We were the first boutique hotel and restaurant company in the U.S, thanks to our founder, Bill Kimpton, and his first hotel in San Francisco. The idea behind our first hotel was simple: a place one could stay that felt more like a beautiful, livable and stylish home than a big, impersonal hotel. We give thanks and gratitude to everyone at the Regent Partners for the Concourse at Landmark Center (aka The King and Queen Towers) Atlanta Georgia for Lighting Up TEAL for the 6th, International Trigeminal Neuralgia Awareness Day on October 7th, 2018! The office project is comprised of five buildings ranging from 4 to 33 stories and includes 2 iconic towers known regionally as the “King and Queen”. Positioned in the heart of the Central Perimeter, this highly recognized and respected project offers an unparalleled presence in the sky-line combined with unrivaled amenities and access relative to its competitive set. ​Virginia Beach Convention Center Virginia Beach, VA United States We give thanks and gratitude to everyone at the Virginia Beach Convention Center Virginia Beach, VA USA for Lighting Up TEAL for the 6th, International Trigeminal Neuralgia Awareness Day on October 7th, 2018! We pride ourselves in being the nation’s first convention center to earn LEED® Gold certification as an existing building from the U.S. Green Building Council. ​ICON Orlando Observation Wheel Orlando Florida United States We give thanks and gratitude to everyone at the ICON Orlando Observation Wheel Orlando Florida USA for Lighting Up TEAL for the 6th, International Trigeminal Neuralgia Awareness Day on October 7th, 2018! Lighting Up Teal October 1st, 2018! ICON Orlando is the tallest observation wheel on the United States East Coast at 400 ft and weighs in at 3 million pounds – that’s 300 school buses! Float effortlessly above the idyllic Orlando skyline for breathtaking views that’ll leave you with an iconic moment you’ll never forget. We give thanks and gratitude to everyone at the Elk River Bridge Charleston WV USA for Lighting Up TEAL for the 6th, International Trigeminal Neuralgia Awareness Day on October 7th, 2018! Elk River Bridge in Charleston, Kanawha County. The structure is 500-feet long and is one of four bridges located at the point where Elk River meets Kanawha River. It was built between 1938 and 1939. The Helmsley Building is a 35-story building located at 230 Park Avenue between East 45th and East 46th Streets in Midtown Manhattan, New York City, which was built in 1929 as the New York Central Building, and was designed by Warren & Wetmore. We give thanks and gratitude to everyone at ​The Enger Tower Duluth Minnesota United States for Lighting Up TEAL for the 6th International Trigeminal Neuralgia Awareness Day on October 7th 2018! Photo by Greg Lundgren Photography. The tower was dedicated by Crown Prince Olav and Crown Princess Martha of Norway on June 15, 1939. The dedication was in honor of Bert Enger, a native of Norway who came to this country and became a successful furniture dealer. At the time of his death Mr. Enger donated two thirds of his estate to the city of Duluth. This included the land known as Enger Hill which includes Enger Tower, the park and Enger Golf Course. London Life Building Ontario Canada We give thanks and gratitude to everyone at London Life Building Ontario Canada for Lighting Up TEAL for the 6th International Trigeminal Neuralgia Awareness Day on October 7th 2018! ​ In addition to providing a broad range of financial security products to individuals, families, businesses and organizations, we are a strong supporter of communities across the country. Our success comes by working directly with hundreds of national, regional and local community organizations, through our head office locations and our network of field offices across Canada. ​ArtsQuest Center at SteelStacks Bethlehem Pa USA ​ We give thanks and gratitude to everyone at ArtsQuest Center at SteelStacks Bethlehem Pa United States for Lighting Up TEAL for the 6th International Trigeminal Neuralgia Awareness Day on October 7th, 2018! Bank of The West Tower Sacramento Ca We give thanks and gratitude to everyone at The Bank of West Tower Sacramento CA USA for Lighting Up TEAL for the 6th International Trigeminal Neuralgia Awareness Day on October 7th, 2018! With abundant amenities including on-site building management, 24-hour security, state-of-the-art fitness center with shower and locker facilities, cable-ready access, legislative audio access, overnight express center, Specialty's Cafe & Bakery, and on-site parking, Bank of the West Tower provides it’s tenants with a superior business environment. ​Skydance Bridge Oklahoma City Oklahoma USA We give thanks and gratitude to everyone at The ​Skydance Bridge Oklahoma City Oklahoma for Lighting Up TEAL for the 6th, International Trigeminal Neuralgia Awareness Day on October 7th, 2018! ​Skydance Bridge is a 380-foot-long pedestrian bridge with a 197- foot-tall sculpture that spans Interstate 40 near Robinson Avenue south of downtown. The bridge’s soaring architecture was inspired by Oklahoma’s state bird, the scissor-tailed flycatcher. The bridge is located on Harvey Avenue between SW 7th and SW 10th. ​The I-35W Saint Anthony Falls Bridge was opened to the public on September 18, 2008, at 5 a.m. Using the innovative design-build project delivery method, the replacement bridge opened over three months ahead of schedule, and was awarded the "Best Overall Design-Build Project Award" for 2009 from the Design-Build Institute of America. Leicester Clock Tower Leicester United Kingdom We give thanks and gratitude to everyone at Leicester City Council UK and Leicester Clock Tower Leicester UK for Lighting Up TEAL for the 6th International Trigeminal Neuralgia Awareness Day on October 7th 2018! UPDATE: fault with the lighting on and around the clock tower and it might not light up. The Clock Tower area has been a focal point for Leicester people throughout its history: this was one of the three places in the town where proclamations were read out by the town crier on important occasions; a few of the older residents can remember V.E. celebrations being held around the Clock Tower and nowadays it is a focal point for our Christmas festivities each year with its magnificent Christmas tree helping to get us into the Christmas spirit. ​The Gateshead Millennium Bridge Gateshead United Kingdom We give thanks and gratitude to everyone at the Gateshead Council in United Kingdom for Lighting Up Teal for the 6th International Trigeminal Neuralgia Awareness Day on October 7th 2018! "Local people have taken the bridge to their hearts as a symbol of Gateshead's renaissance, and we are thrilled that the bridge now looks set to appear on a pound coin in the near future. ​Brant St Pier Burlington ON Canada We give thanks and gratitude to everyone at Brant St Pier Burlington ON Canada for Lighting Up TEAL for the 6th, International Trigeminal Neuralgia Awareness Day on October 7th 2018! A signature destination and attraction in Spencer Smith Park at the Waterfront at Downtown Burlington, the Brant Street Pier extends 137 metres over Lake Ontario, providing breathtaking views of the lake and Burlington's shoreline. The Brant Street Pier officially opened during the Sound of Music Festival in Spencer Smith Park on Father's Day weekend in 2013. Sails at Canada Place Vancouver We give thanks and gratitude to everyone at Canada Place Vancouver Canada for Lighting Up the Sails TEAL for the 6th, International Trigeminal Neuralgia Awareness Day on October 7th 2018! Canada Place opened in 1986 as the Canada Pavilion for Expo 86 and has since become a national icon and a hub of activity on Vancouver’s waterfront. Canada Place provides visitors with inspirational Canadian experiences, from interactive and educational elements to world-class national celebrations. We give thanks and gratitude to everyone at Georgina Civic Centre Georgina Canada for Lighting Up TEAL for the 6th International Trigeminal Neuralgia Awareness Day on October 7th 2018! The Town of Georgina is the northernmost municipality in York Region. The Town was amalgamated in 1970, merging six dispersed communities (areas of which were previously part the Town of North Gwillimbury). ​We give thanks and gratitude to everyone at ​Sifton Properties on Dufferin London ON Canadafor Lighting Up TEAL for the 6th International Trigeminal Neuralgia Awareness Day on October 7th, 2018! Beginning October 5th, through October 8th, 2018! ​Walter J. Blackburn Memorial Fountain We give thanks and gratitude to everyone at Walter J. Blackburn Memorial Fountain City of London Ontario Canada for Lighting Up TEAL for the 6th International Trigeminal Neuralgia Awareness Day on October 7th, 2018! Beginning October 5th, through October 8th, 2018! We give thanks and gratitude to everyone at The J. Allyn Taylor Building Canada for Lighting Up TEAL for the 6th, International Trigeminal Neuralgia Awareness Day on October 7th, 2018! Beginning October 5th, through October 8th, 2018! ​The J. Allyn Taylor Building supports the scale and massing pattern of London's downtown streetscape. Its street level design, without storefront windows, displays a detail and quality in execution that is not often achieved in buildings of the 20th century. The J. Allyn Taylor Building was constructed, in 1928, for use by the Bank of Toronto. ​Boston City Hall Boston Massachusetts We give thanks and gratitude to everyone at The Boston City Hall for Lighting Up TEAL (Lt. Blue) for the 6th, International Trigeminal Neuralgia Awareness Day on October 7th, 2018! Mayor Walsh’s vision is of a thriving, healthy, and innovative Boston — a City with equality and opportunity for all, where a revolutionary history inspires creative solutions to the challenges of the 21st century. CN Tower Toronto Canada We give thanks and gratitude to everyone at CN Tower Toronto Canada for Lighting Up Teal for the 6th International Trigeminal Neuralgia Awareness Day on October 7th, 2018! ​New York Life Insurance Company Building We give thanks and gratitude to everyone at ​New York Life Insurance Company Building New York NY for Lighting Up Teal for the 6th, International Trigeminal Neuralgia Awareness Day on October 7th, 2018! Designed in 1926 by Cass Gilbert who also designed the landmark Woolworth Building, the massive building rises forty stories to its pyramidal gilded roof while occupying the full block between 26th Street, 27th Street, Madison Avenue and Park Avenue South, a rarity in Manhattan. The New York Life Building stands 615 feet (187 m) tall and contains 40 floors. Inspired by Salisbury Cathedral it was the last significant Gilbert skyscraper in Manhattan. 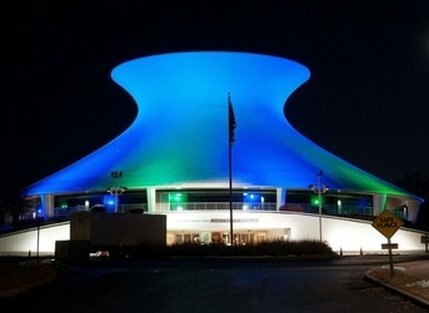 The Saint Louis Science Center's James S. McDonnell Planetarium St. Louis, MO We give thanks and gratitude to everyone at ​The Saint Louis Science Center's James S. McDonnell Planetarium, St. Louis MO for Lighting Up Teal for the 6th, International Trigeminal Neuralgia Awareness Day on October 7th, 2018! ​The Saint Louis Science Center's James S. McDonnell Planetarium is one of the nation's leading space education facilities. It features the unique Boeing Space Station, with two fabulous levels of exhibits that incorporate scientific research, illustrating the future of space travel. The Orthwein StarBay has several lab areas, including the SBC Learning Center, that gives you a glimpse of what it's like to live and work on the International Space Station. The Central Bar & Restaurant in Navan, Co. Meath Ireland We give thanks and gratitude to everyone at ​The Central Bar & Restaurant in Navan, Co. Meath Ireland for Lighting Up Teal for the 6th, International Trigeminal Neuralgia Awareness Day on October 7th, 2018! The Central is a multi purpose venue with 5 bars both indoor and outdoor, a unique ‘vintage lounge', casual restaurant, Ruby Room, cafe, heated rooftop terrace and a kids play area – all in the heart of Navan town centre. We give thanks and gratitude to everyone at The Crowne Plaza Hotel Dublin Airport Ireland for Lighting Up TEAL for the 6th, International Trigeminal Neuralgia Awareness Day on October 7th 2018! The Crowne Plaza Dublin Airport, one of the largest Conference Hotels in Ireland and a 4 star Dublin Airport Hotel. The Crowne Plaza Dublin Airport is located just minutes away from Dublin Airport. The Nanaimo Bastion - Nanaimo, Vancouver Island, BC, Canada We give thanks and gratitude to everyone at The Nanaimo Bastion - Nanaimo, Vancouver Island, BC, Canada ​for Lighting Up TEAL for the 6th International Trigeminal Neuralgia Awareness Day on October 7th, 2018! The Bastion is an enduring local icon in the third oldest city in British Columbia. Built in 1853, the three floors of the Bastion were skillfully crafted using traditional wood working techniques by workers of the Hudson’s Bay Company. Over the years, politics and land deals saw this sturdy wooden fort moved twice. Today it is Nanaimo’s most recognizable landmark. ​Vancouver City Hall Vancouver Canada We give thanks and gratitude to everyone at the Vancouver City Hall Vancouver Canada for Lighting Up TEAL for the 6th International Trigeminal Neuralgia Awareness Day on October 7th, 2018! The Falkirk Wheel Scotland We give thanks and gratitude to everyone at The Falkirk Wheel Scotland for Lighting Up TEAL for the 6th International Trigeminal Neuralgia Awareness Day on October 7th, 2018 even as the light may vary between green and blues because of colour selector. The Falkirk- the world's first and only rotating boat lift - was the eventual outcome of our collaboration with a design team that combined international experience of joint venture contractor Morrison-Bachy-Soletanche with leading specialists from Ove Arup Consultants, Butterley Engineering and Scotland-based RMJM architects. Completion of The Millennium Link project was officially marked by Her Majesty The Queen on 24 May 2002 at The Falkirk Wheel. ​Prudential Plaza Chicago, IL We give thanks and gratitude to everyone at The ​Prudential Plaza Chicago, IL for Lighting Up TEAL for the 6th International Trigeminal Neuralgia Awareness Day on October 5th & 8th, 2018! Prudential Plaza consists of two Class A high-rise office towers, totaling approximately 2.2 million square feet, which are located in the East Loop of Chicago, Illinois. The two office towers share a common lobby and mezzanine level. The buildings are situated on a beautifully landscaped 3.3 acres and also have a five-level underground parking garage. Prudential Plaza occupies a full city block and is connected to an underground network of pedestrian walkways. Thank you Mayor of Krakow Mr. Jacek Majchrowski and everyone in Krakow Poland! We give thanks and gratitude to everyone for spreading awareness for the 6th International Trigeminal Neuralgia Awareness Day on October 7th 2018! ​Elizabeth Quay Bridge Perth Australia We give thanks and gratitude to everyone at ​Elizabeth Quay Bridge Perth Australia for Lighting Up TEAL for the 6th International Trigeminal Neuralgia Awareness Day on October 7th 2018! The bridge forms part of the popular 'bridges' recreational route along the Swan River and provides a link between the promenades, the island and Barrack Street Jetty. Offering spectacular views towards the river and back to the city the bridge is a popular photo point for tourists and locals alike. ​One Liberty Place Philadelphia, PA We give thanks and gratitude to everyone at One Liberty Place in Philadelphia for Lighting Up TEAL for the 6th International Trigeminal Neuralgia Awareness Day on October 7th 2018! "RISING HIGH ABOVE PHILADELPHIA is a shining silver spire located atop One Liberty Place. It’s not just an architectural landmark but at 1,090 feet above the streets the silver spire serves Metro Philadelphia as the signal source for major TV broadcasters and several FM radio stations. Every bit as impressive as the building’s outer form, the impressive telecom facilities inside make it unique among office buildings." ​Surrey's Civic Plaza BC Canada We give thanks and gratitude to everyone at Surrey's Civic Plaza BC Canada for Lighting Up TEAL for the 6th International Trigeminal Neuralgia Awareness Day on October 7th, 2018! Connecting City Hall, Surrey City Centre Library, SFU and the Civic 3 Tower, this dynamic outdoor community hub is the ideal centralized location for community celebrations. Fitzsimmons Bridge Whistler BC Canada We give thanks and gratitude to everyone at Fitzsimmons Bridge Whistler BC Canada for Lighting Up TEAL for the 6th International Trigeminal Neuralgia Awareness Day on October 7th, 2018! Whistler is a town north of Vancouver, British Columbia, that's home to Whistler Blackcomb, one of the largest ski resorts in North America. Besides skiing and snowboarding, the area offers snowshoeing, tobogganing and ski jumping at the Olympic Park, a venue for the 2010 Vancouver Winter Olympics. Skylon Tower Niagara Falls We give thanks and gratitude to the Skylon Tower in Niagara Falls, Canada for "Light Up Teal" on our 6th International Trigeminal Neuralgia Awareness Day on October 7th 2018! Skylon Tower located in the heart of the Niagara Falls hotel, dining and entertainment district, the Skylon Tower is the most famous landmark next to the Falls. The Skylon Tower offers visitors the very best in Niagara Falls attractions, Niagara Falls dining as well as entertainment and shopping. city's range of museums are Museum London, a showcase for regional art and historical artefacts, and the interactive Children's Museum. The city centre features numerous parks and green-ways along the Thames River. We give thanks and gratitude to everyone at The Welland Bridge 13 in Welland, Ontario Canada for Lighting Up Teal for the 6th, International Trigeminal Neuralgia Awareness Day on October 7th, 2018! ​TORONTO 3D Sign Toronto Canada We give thanks and gratitude to everyone at The TORONTO 3D Sign Toronto Canada for Lighting Up TEAL for the 6th, International Trigeminal Neuralgia Awareness Day on October 7th, 2018! ​An illuminated, 3D TORONTO Sign was installed at Nathan Phillips Square in July 2015 for the TORONTO 2015 Pan American/Parapan American Games. Due to popular demand, the Sign still remains on the Square. The WoodmenLife Tower Omaha NE We give thanks and gratitude to everyone at The WoodmenLife Tower Omaha NE for Lighting Up TEAL for the 6th, International Trigeminal Neuralgia Awareness Day on October 7th 2018! The WoodmenLife Tower has served as a focal point of the Omaha skyline and part of the city's downtown business district since 1969. Rising 30 stories and 478 feet above the bustling city streets the WoodmenLife Tower is truly an Omaha landmark. The Wrigley Building Clock Tower We give thanks and gratitude to everyone at the Wrigley Building Clock Tower Chicago IL for Lighting Up TEAL for the 6th, International Trigeminal Neuralgia Awareness Day on October 7th 2018! The Wrigley Building was Chicago’s first air-conditioned office building.​ The bridge between the two towers on the 14th floor was added in 1931 to connect space occupied by a bank. The walkway was required by a Chicago ordinance concerning bank branch offices. ​Pelham Town Arches Niagara Canada ​We give thanks and gratitude to everyone in the town of Pelham Niagara Canada for Lighting Up TEAL the Town Arches for the 6th, International Trigeminal Neuralgia Awareness Day on October 7th, 2018! ​We give thanks and gratitude to everyone at ​The Blackrock Castle Observatory Blackrock Castle Cork Ireland for Lighting Up TEAL for the 6th, International Trigeminal Neuralgia Awareness Day on October 7th 2018! ​We give thanks and gratitude to everyone at ​Cliff House Hotel in Ardmore, Co. Waterford Ireland for Lighting Up TEAL for the 6th, International Trigeminal Neuralgia Awareness Day on October 7th 2018! ​​As a luxury hotel in Waterford, Ireland, The Cliff House Hotel is well placed to access a number of cultural events and destinations for all ages and interests. This includes good proximity to historical Cork City. The Radisson Blu's Ditchley House,Little Island, Cork Ireland We give thanks and gratitude to everyone at The Radisson Blu's Ditchley House Cork Ireland for Lighting Up TEAL for the 6th, International Trigeminal Neuralgia Awareness Day on October 7th, 2018! Upon entering the 9-acre grounds of the award-winning Radisson Blu Hotel & Spa, Cork, you will find yourself inspired by the lush surroundings of this peaceful retreat that is just 15 minutes from the airport and Cork city centre. ​Dun-Laoghaire Rathdown Town Hall in Dublin Ireland We give thanks and gratitude to everyone at The Dun-Laoghaire Rathdown Town Hall in Dublin Ireland for Lighting Up TEAL for the 6th, International Trigeminal Neuralgia Awareness Day on October 7th, 2018! ​A day trip to the Dún Laoghaire-Rathdown area can be a leisurely coastal walk followed by treats at an artisanal market, a high-octane adventure through the sea or a more contemplative browse through historical treasures. There truly is something for everyone here. We give thanks and gratitude to everyone at St. Aidan's Cathedral In Enniscorthy CO. Wexford Ireland for Lighting Up TEAL for the 6th, International Trigeminal Neuralgia Awareness Day on October 7th, 2018! 1994: St. Aidan’s is restored in its original Pugin style using authentic colours, materials and techniques. It is now an outstanding example of the many structural and decorative characteristics of the Gothic Revival’s greatest exponent of ecclesiastical architecture. The restoration cost one million pounds. St. Coleman's Cathedral Cobh We give thanks and gratitude to everyone at St. Coleman's Cathedral Cork Ireland for Lighting Up TEAL for the 6th, International Trigeminal Neuralgia Awareness Day on October 7th 2018! ​In 1868, when the Cathedral was begun taking an impressive 47 years to complete in full. Cobh or Queenstown as it was then called, was a relatively prosperous place. This was because it was Ireland’s principal emigration outlet. More than five million people emigrated from Ireland in the nineteenth century – mainly to the United States, Australia and Canada and a large proportion of them left from Queenstown and in fact was one of the last sights they would have had of their homeland. ​Cork City Hall Ireland We give thanks and gratitude to everyone at Cork City Hall, Cork Ireland for Lighting Up TEAL for the 6th, International Trigeminal Neuralgia Awareness Day on October 7th 2018! The Canada Peace Bridge We give thanks and gratitude to everyone at the Buffalo and Fort Erie Peace Bridge Authority for Lighting Up TEAL for the 6th International Trigeminal Neuralgia Awareness Day on October 7th 2018! ​It will turn TEAL at dusk and remain that colour until 1:00 am. ​The Sichuan Tower of China We give thanks and gratitude to everyone at The Sichuan Tower of China for Lighting Up TEAL for the 6th, International Trigeminal Neuralgia Awareness Day on October 7th, 2018! ​The Sichuan TV Tower, 339 meters high, is located in Chengdu, The reinforced concrete structure is a multifunctional modern tower combined with broadcasting, tourism, dining and entertainment. Designed by the Designing Institute, the Ministry of Radio, Film and Television of China, the tower started construction in December of 1992 and was put into use in October 2006. The Sichuan TV tower has is the tallest in western China. The Niagara Falls!! We give thanks and gratitude to everyone at The Niagara Falls Illumination Board for Lighting Up TEAL for the 6th International Trigeminal Neuralgia Awareness Day on October 7th 2018! ​The Falls will be illuminated Teal at 10:00 p.m. for fifteen (15) minute duration. ​The ceremonial entrance and front fountain of The Parliament Buildings BC Canada ​We give thanks and gratitude to everyone at The Parliament Buildings BC Canada for Lighting Up TEAL for the 6th, International Trigeminal Neuralgia Awareness Day on October 7th, 2018! ​Welcome to the Parliament Buildings, home to the Legislative Assembly of British Columbia where elected representatives – called Members of the Legislative Assembly or MLAs – meet to shape the future of the province by debating and passing the laws that govern British Columbia.govern British Columbia. Camara Municipal de Sao Caetano do Sul, Sao Caetano do Sul located at Sao Paulo Brazil We give thanks and gratitude to everyone at The Camara Municipal de Sao Caetano do Sul Brazil for Lighting Up TEAL for the 6th International Trigeminal Neuralgia Awareness Day on October 7th, 2018! We like to give a BIG THANK YOU, to Councilman Cesar Oliva!! The Oamaru Opera House New Zealand We give thanks and gratitude to everyone at The Oamaru Opera House New Zealand for Lighting Up TEAL for the 6th, International Trigeminal Neuralgia Awareness Day on October 7th, 2018 and every year!! For over a century, the Opera House has represented the heart, soul and passions of Oamaru. It has been a hub for social, political and cultural activity and continues to evolve as a venue for performing arts, functions and conferences. The building was officially opened on October 7th, 1907 and remains largely in its original condition, having been restored in 2010, winning an NZIA Heritage award. Wells Fargo's Duke Energy Center We give thanks and gratitude to everyone at the Wells Fargo's Duke Energy Center for Lighting Up TEAL for the 6th, International Trigeminal Neuralgia Awareness Day on October 7th 2018! Crystal Bridge - Myriad Botanical Gardens Oklahoma City, OK USA We give thanks and gratitude to everyone at The Crystal Bridge Oklahoma City OK USA for Lighting Up TEAL for the 6th, International Trigeminal Neuralgia Awareness Day on October 7th, 2018! ​Olympic Plaza at Calgary, Alberta Canada We give thanks and gratitude to everyone at ​the Olympic Plaza at Calgary, Alberta Canada ​​for Lighting Up TEAL for the 6th International Trigeminal Neuralgia Awareness Day on October 7th 2018! ​Olympic Plaza was built in 1988 for the Olympic Winter Games in Calgary as the site of the medal presentation ceremonies and now hosts many special events & festivals throughout the year. It is also a wonderful place to sit and enjoy your lunch during the noon hour. 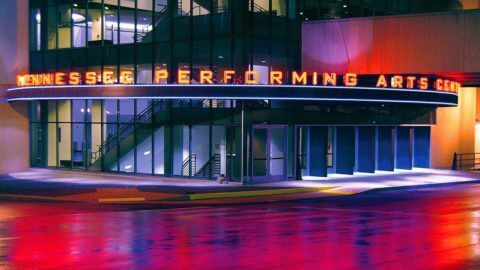 ​Jubilee Auditorium Calgary Canada We give thanks and gratitude to everyone at ​the Jubilee Auditorium Calgary Canada ​for Lighting Up TEAL for the 6th International Trigeminal Neuralgia Awareness Day on October 7th 2018! Originally built between 1955 and 1957 as a gift to the people of Alberta, the mandate of the Alberta Jubilee Auditorium is to provide a place of celebration where community spirit and cultural enrichment thrive. Today, the rejuvenated Jubilee Auditorium continues its tradition of public service. Stephen Avenue Galleria Trees Calgary Canada ​We give thanks and gratitude to everyone at ​the Stephen Avenue Galleria Trees Calgary Canada ​for Lighting Up TEAL for the 6th International Trigeminal Neuralgia Awareness Day on October 7th 2018! The Galleria Trees sculptures are an iconic part of Stephen Avenue (8th avenue) located outside Bankers Hall between 2nd and 3rd street SW. These ten metal trees were installed in 2000 upon the completion of the 2nd tower of Bankers Hall. They were designed to reduce wind gusts on the block that could be caused between Bankers Hall and the Home Oil Tower. ​Glenbow Museum Calgary, Alberta, Canada We give thanks and gratitude to everyone at ​Glenbow Museum Calgary, Alberta, Canada ​for Lighting Up TEAL for the 6th International Trigeminal Neuralgia Awareness Day on October 7th 2018! ​ Arts Commons Calgary, Alberta, Canada We give thanks and gratitude to everyone at Arts Commons Calgary, Alberta, Canada ​for Lighting Up TEAL for the 6th International Trigeminal Neuralgia Awareness Day on October 7th 2018! 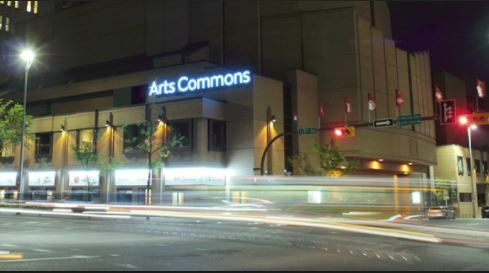 Arts Commons is one of Canada’s largest and most vibrant arts centres. Located in the heart of Calgary’s Cultural District in the downtown core, the centre occupies a full city block and is home to five theatres and the world-class Jack Singer Concert Hall. ​The TORCH DOHA We give thanks and gratitude to everyone at THE TORCH DOHA Aspire Zone for Lighting Up TEAL for the 6th International Trigeminal Neuralgia Awareness Day on October 7th 2018! ​At 300 meters high and with 360° panoramic views across Doha, The Torch is haven for discerning visitors, from sports enthusiasts and business leaders to health and wellness seekers. City Hall of Houston, Houston Texas We give thanks and gratitude to everyone at the City Hall of Houston, Houston Texas for Lighting Up TEAL for the 6th International Trigeminal Neuralgia Awareness Day! City Hall of Houston will be lit teal October 2nd to October 4th, 2018! City Hall of Houston Texas: The ground floor of City Hall now is home to the Greater Houston Convention and Visitors Bureau and its Visitors Center. Houston's City Government has over 500 buildings utilized by the over 23,000 City employees. ​TAIPEI 101, Taiwan We give thanks and gratitude to everyone at the TAIPEI 101, Taiwan in Taiwan for Lighting Up TEAL for the 6th, International Trigeminal Neuralgia Awareness Day on October 7th, 2018! This year they will also gather other buildings in Xinyi District (including office buildings, department stores and hotel)! The TAIPEI 101, Taiwan office center offers a world-class office environment and is worthy of consideration as an advantageous location for multinational corporations located in Taiwan. Aside from its location in the national, master-planned Hsinyi District, TAIPEI 101 possesses numerous competitive advantages such as 2,644 square meters of unobstructed floor space, ceilings that exceed the height of most other office buildings, as well as spacious lobbies, exhibition chambers, and public spaces. ​The Grand villa Casino Burnaby B.C. Canada We give thanks and gratitude to everyone at the ​The Grand villa Casino Burnaby B.C. Canada for Lighting Up TEAL for the 6th International Trigeminal Neuralgia Awareness Day on October 7th 2018! 7 delectable dining and lounge choices. Plus, enjoy live entertainment and stay at our luxurious Delta Burnaby Hotel and Conference Centre. Visit the Villa, it’s the centre of all the action! ​​The Forks Canopy Winnipeg MB Canada We give thanks and gratitude to everyone at the ​The Forks Canopy Winnipeg MB Canada for Lighting Up TEAL for the 6th International Trigeminal Neuralgia Awareness Day on October 7th 2018! Welcome to The Forks, Winnipeg’s meeting place. Nestled in the heart of downtown, The Forks is one of Winnipeg’s most beloved places, at the junction of the Assiniboine and mighty Red rivers. Charlottetown City Hall Canada We give thanks and gratitude to everyone at the Charlottetown City Hall Prince Edward Island Canada for Lighting Up TEAL for the 6th International Trigeminal Neuralgia Awareness Day on October 7th 2018! Charlottetown, the Capital City of Prince Edward Island, is the perfect blend of urban excitement, country living and some of the cleanest air in Canada. Enjoy a stroll on National Historic Great George Street; sit amongst the trees on Victoria Row; or shop on Queen Street. ​Trafalgar Bridge Perth Australia We give thanks and gratitude to everyone at the City of Perth for Trafalgar Bridge Perth Australia for Lighting Up TEAL for the 6th International Trigeminal Neuralgia Awareness Day on October 7th 2018! Trafalgar Bridge is a bridge within Trafalgar Bridge is a bridge within Western Australia and is nearby to Heirisson Island, Highgate and Perth. Trafalgar Bridge is also close to Haig Park Place, Goongoongup Bridge and Gloucester Park. The Calgary Tower Alberta Canada We give thanks and gratitude to everyone at The Calgary Tower Calgary, Alberta Canada for Lighting Up TEAL for the 6th, International Trigeminal Neuralgia Awareness Day on October 7th, 2018! The Calgary Tower offers the best view in the city and is a must-see on any visitor's itinerary. On the Observation Deck you'll experience a spectacular 360° view of the bustling city, the majestic Rocky Mountains, the foothills, and the prairies. TELUS Spark, the new Science Centre We give thanks and gratitude to everyone at the Telus Spark Calgary, AB Canada for Lighting Up TEAL for the 6th International Trigeminal Neuralgia Awareness Day on October 7th, 2018! TELUS Spark is Calgary's Science Centre. Facilitators fuel curiosity. Exhibits and programs ignite a sense of wonder and excitement. Conferences and events act as a catalyst for innovation and new ideas. TELUS Spark is a place for people of all ages and abilities to let go and embrace the desire to explore and discover science, technology, engineering, art and math. ​The Bell Tower in Perth Australia, We give thanks and gratitude to everyone at The Bell Tower in Perth Australia for Lighting Up TEAL for the 6th, International Trigeminal Neuralgia Awareness Day on October 7th 2018! ​Bob Kerrey Pedestrian Bridge Omaha, NE We give thanks and gratitude to everyone for Lighting Up Teal the Bob Kerrey Pedestrian Bridge Omaha, NE for the 6th International Trigeminal Neuralgia Awareness Day on October 7th, 2018! The Bob Kerrey Pedestrian Bridge, also known as the Footbridge, is a walking bridge connecting Council Bluffs, IA to Omaha's Riverfront, just north of Downtown. The bridge opened on September 28, 2008, and is named after the Nebraska Senator who secured funding for the project, Senator Bob Kerrey. The Mid-Hudson Bridge New York USA We give thanks and gratitude to everyone for Lighting Up Teal the Mid-Hudson Bridge for the 6th International Trigeminal Neuralgia Awareness Day on October 7th, 2018! ​ In the summer of 2001, necklace lighting was installed on the bridge. Designed by Baker Engineering, the system uses energy efficient LED fixtures. Each fixture is powered by a patented technology which uses multi-colored LEDs and a microprocessor to create over 16.7 million colors and color changing effects. The Absolute Towers aka.. Marilyn Monroe Towers Mississauga Canada We give thanks and gratitude to everyone at the Absolute Towers aka Marilyn Monroe Towers Mississauga Canada for Lighting Up TEAL for the 6th International Trigeminal Neuralgia Awareness Day on October 7th, 2018! Home to Toronto Pearson International, Canada's largest airport servicing 32 million passengers on more than 70 airlines with non-stop service to 180 destinations in 60 countries around the globe. Mississauga is also within a day's drive of North America's richest markets with access to 164 million consumers. Dr. Martin Luther King, Jr. January 15, 1929 - April 4, 1968 The City of Fort Wayne, Indiana dedicated a major bridge structure to the legacy and memory of Dr. King, Jr.
​Note from Toni Saunders...aka..TNnME -Everyone at Leonard Zakim Bunker Hill Bridge will forever hold a special place in my heart as they were the first one to say yes to light up teal back in 2013 which led to our first Light Up Teal Campaign for the last 6 years. Thank you! We give thanks and gratitude to everyone at The Leonard Zakim Bunker Hill Bridge in Boston Ma for Lighting Up TEAL for the 6th International Trigeminal Neuralgia Awareness Day on October 7th 2018! Hilton Columbus Hotel Downtown Columbus OH We give thanks and gratitude to everyone at The Hilton Columbus Downtown Hotel OH for Lighting Up TEAL for the 6th International Trigeminal Neuralgia Awareness Day on October 7th, 2018! ​​As the most recognized name in the industry, travelers all over the world have been saying “Take me to the Hilton” for almost a century. And because of our innovative approach to products, amenities, and service, Hilton continues to be synonymous with hotel across the globe. ​Kenneth F. Burns Memorial Bridge Worcester MA We give thanks and gratitude to everyone at MassDOT-Kenneth F Burns Memorial Bridge Worcester Ma for Lighting Up TEAL for the 6th International Trigeminal Neuralgia Awareness Day on October 7th, 2018! The Kenneth F. Burns Memorial Bridge is a signature initiative of the Commonwealth of Massachusetts' historic Accelerated Bridge Program. The replacement bridge will carry Route 9, known as Belmont Street in Worcester and Boston Turnpike in Shrewsbury, over Lake Quinsigamond. ​Tallinn Television Tower, Estonia We give thanks and gratitude to everyone at Tallinn Television Tower Estonia for Lighting Up TEAL for the 6th International Trigeminal Neuralgia Awareness Day on October 7th, 2018! It was built to provide better telecommunication services for the 1980 Moscow Summer Olympics regatta event. The TV Tower is now a great tourist, culture and leisure centre. Waiting for you at the tower: open platform at 175m meters, an indoor panoramic view from 170 metres, restaurant and terrace on the 22nd floor; interactive multimedia solutions that introduce Estonia and Tallinn; view of the ground through the glass floor of the platform; futuristic interior milieu; attractions for children; mini TV studio, gift shop and outdoors playground. ​MEET Las Vegas We give thanks and gratitude to everyone at MEET Las Vegas Nevada for Lighting Up TEAL for the 6th, International Trigeminal Neuralgia Awareness Day on October 7th 2018! MEET is the Special Event and Meeting destination in Las Vegas. Our high tech facility is designed to make anything possible and we are proud to go teal and help support this movement. This unique venue is the winner of the 2014 Unique Venues Best Venue for the Latest and Greatest Technology and winner of the 2013 Event Solutions Event Site of the Year. Since opening in 2010 this center has become the premiere space in downtown Las Vegas, blending technology and grandeur together for an unforgettable experience. Halifax City Hall Canada We give thanks and gratitude to everyone at The Halifax City Hall Canada for Lighting Up TEAL for the 6th, International Trigeminal Neuralgia Awareness Day on October 7th 2018! ​The Reconciliation Bridge Canada We give thanks and gratitude to everyone at The Reconciliation Bridge formerly known as the Langevin Bridge for Lighting Up TEAL for the 6th International Trigeminal Neuralgia Awareness Day on October 7th 2018! The 100-year-old reconciliation Bridge in East Village is lit with thousands of LED lights that change with the seasons and in honour of holidays and events. Art and culture are literally built-in to East Village – both were an integral part of the master plan that has guided the development of EV since 2009. High Level Bridge Canada We give thanks and gratitude to everyone at The High Level Bridge in Edmonton Alberta Canada for Lighting Up TEAL for the 6th International Trigeminal Neuralgia Awareness Day on October 7th, 2018! ​Edmonton’s High Level Bridge is a massive structure and a significant landmark for the City of Edmonton and Civil Engineering alike. It is a steel truss bridge featuring 28 individual spans that sit 49 metres above the North Saskatchewan River atop concrete piers and steel legs. The bridge carries pedestrian, vehicular and rail traffic 755 metres across the entire river valley, linking the downtown core with Old Strathcona via 109th Street. ​Cathedral in Guildford Surrey England We give thanks and gratitude to everyone at Cathedral in Guildford Surrey England for ​showing Social Media Support for Lighting Up TEAL for the 6th International Trigeminal Neuralgia Awareness Day on October 7th 2018! How to request “Light Up Teal” for 2018?